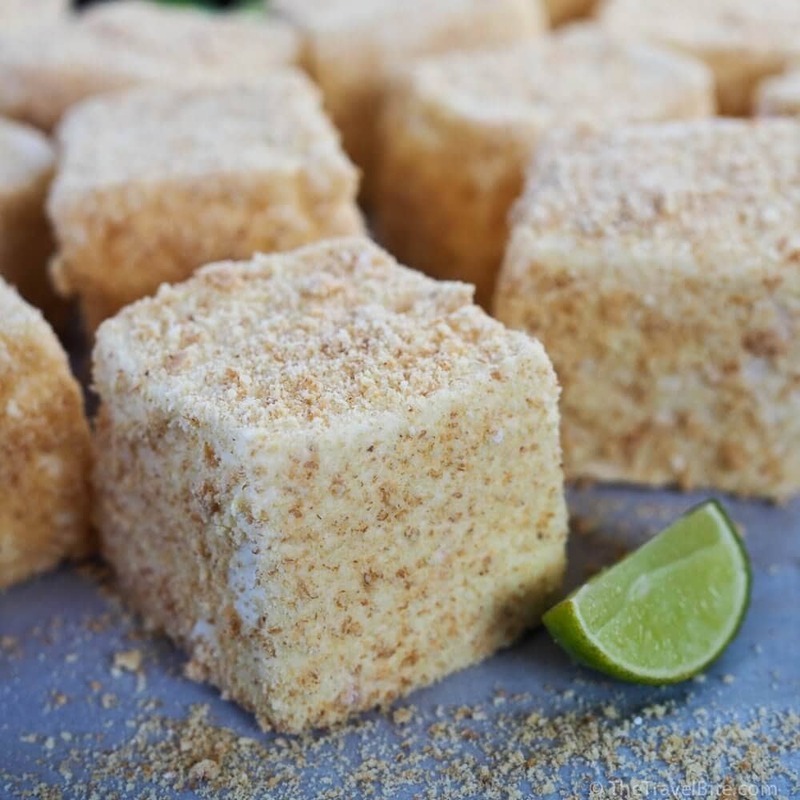 Homemade marshmallows are easy to make, and this key lime pie marshmallow recipe is the perfect treat for key lime pie fans! Have you ever tried homemade marshmallows? 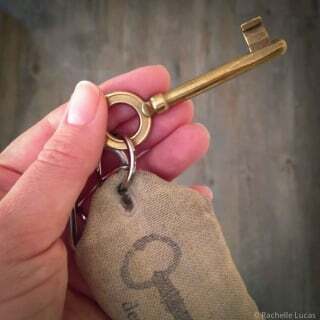 Fair warning, once you have, you’ll never want store bought ones again. There’s a little more fluff, a lot more flavor, and they are really fun to make. The first time I whipped up a batch, I swear I ran through the house with a marshmallow fluff covered spatula proclaiming, “I made marshmallows!” in the same way Tom Hanks shouted, “I made fire!” during the movie Castaway. Inspired by Pete’s favorite flavor of dessert (seriously, our refrigerator is even stocked with Chobani Key Lime Flips at all times), I took my original homemade marshmallows recipe and tweaked it a bit to make key lime pie marshmallows. 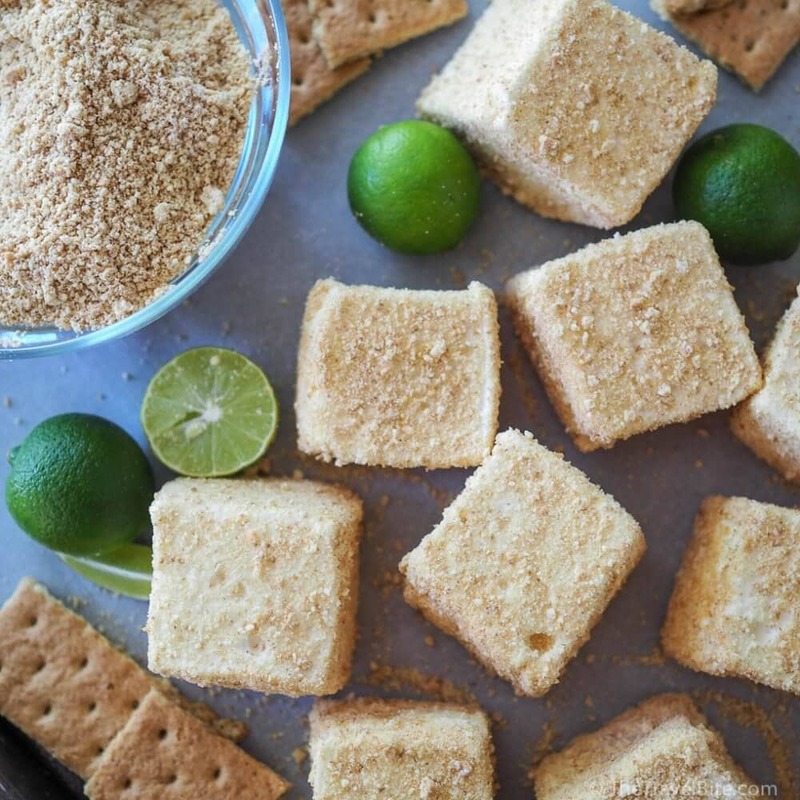 I swapped the water for key lime, and instead of rolling them in a concoction of powdered sugar and corn starch, I rolled them in graham cracker crumbs instead. These are perfect for summertime here in Florida! And Pete loved them so much that he’s been texting me new marshmallow flavor ideas he wants to try. Most grocers will sell graham cracker crumbs in the baking section. However, if you can’t find them, just add a sleeve of graham crackers to a gallon sized ziplock bag and crush them with a wooden spoon until they’re a fine powder. If you love the tartness of key lime pie, then definitely use a whole cup of juice as outlined in the key lime pie marshmallow recipe below. If you want them to be more subtle and less tart, than use 1/2 cup of key lime juice with the gelatin, and 1/2 cup of water when boiling the sugar in the second step. Place the gelatin into a large bowl or the bowl of a stand mixer along with 1/2 cup of the key lime juice. In a small saucepan, combine the remaining 1/2 cup key lime juice, granulated sugar, corn syrup and the salt. Place over medium heat, cover and allow to cook for 3 to 4 minutes. Uncover, clip a candy thermometer onto the side of the panand continue to cook until the mixture reaches 240 degrees, approximately 7 to 8 minutes. Once the mixture reaches this temperature, immediately remove from the heat. Turn the mixer on low speed and slowly pour the sugar syrup down the side of the bowl into the gelatin mixture. Once you have added all of the syrup, increase the speed to high. Continue to whip until the mixture becomes very thick and is lukewarm (approximately 12 10 15 minutes). While the mixture is whipping, prepare the pan. Combine confectiners’ sugar and cornstarch in a small bowl. Lightly spray 9x 9 inch baking pan with a nonstick cooking spray. Add the sugar and cornstarch mixture and move around to completely coat the bottom and sides of the pan. Return the remaining mixture to the bowl for later use. Cover bottom of pan with parchment paper and sprinkle with graham cracker crumbs. When marshmallow is ready, pour into the prepared pan, spread evenly with the spatula, and dust the top with graham cracker crumbs to lightly cover. Allow the marshmallows to sit uncovered for at least 4 hours or overnight. Turn the marshmallows out onto a cutting board and cut into 1-inch squares using a pizza wheel dusted with the confectioners’ sugar mixture. Once cut, lightly dust all sides of each marshmallow with graham cracker crumbs. Store in an airtight container for up to 3 weeks. 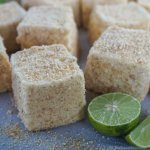 Want to save this key lime pie marshmallow recipe? Pin it!